You remember? “A long time ago in a galaxy far, far away….” [no...ed.] also applies to a cosmos other then Star Wars. The degrading of free speech inevitably leads to censorship and a societal purge of ideas that conflict with the latest evolution of political correctness. The 21st Century version of book burning has gone digital and automated using Artificial Intelligence that applies algorithm filters to exclude the free exchange of different views and accounts of historic analysis. The most partisan progressive cannot maintain that the liberal bias which has now become the hallmark of Google’s search results and news is based upon any objective standards of empirical information or fair and balanced reporting. While it is easy to blame government gatekeepers with the power to remove critical content, the tech giants refuse to put their own houses in order and restore the original results based upon popular traffic. Andrew Couts in Digital Trends wrote several years ago that Google proposes ‘451’ error code to signal Internet censorship, in honor of Ray Bradbury. “Government-imposed online censorship has become increasingly prevalent over the past few years. And the current legislative trends from governments around the world point to a future filled with blocked websites. But simply stopping this from happening is only one part of the battle. When censorship does happen, we need a sign that clearly tells us that that’s the reason for a site’s inaccessibility. Compare this effort with the recent Google update just created a big problem for anti-censorship tools, “App developers won’t be able to use Google to get around internet censorship anymore. The Google App Engine is discontinuing a practice called domain-fronting, which let services use Google’s network to get around state-level internet blocks.” Overseeing the fake news contrived reality coincides with furthering the interests of the globalist establishment. Google is essentially part of the Deep State Intelligence Community; research the history of How The CIA Made Google. So what is the difference when a public company imposes their formula filter to block or conceal content that does not conform to their authoritarian pro government sentiments from an actual NSA, CIA of DOD psyops operation? Robert Tracinski from the Federalists pens an insightful argument in his column, The Plug Must Be Pulled On Google’s Plan For Thought Control. Drawing his conclusion from the Gene Rodenberry Star Trek series, forecasts the objective of the Google controlled reality brainwashing that is being rolled out in earnest. How does this utopia matrix come into being may not surprise the perceptive, but for the average internet user, most still do not care. Google has an Actual Secret Speech Policesystem in place to eliminate, especially dangerous critical elite videos, from the public consciousness. “More than 100 nongovernment organizations (NGOs) and government agencies around the world help police YouTube for extremist content, ranging from so-called hate speech to terrorist recruiting videos. All of them have confidentiality agreements barring Google, YouTube’s parent company, from revealing their participation to the public, a Google representative told The Daily Caller on Thursday. The symbolism of the 451 error code is not that it is a fault of solely a government endeavor but is an integral part of a tech quasi protector for the liberal ‘enlightened’ society. The Google culture is populated with progressives. James Bartholomew writes from the UK in The Spectator, What explains the idiocy of the liberal elite? It’s their education. “Let’s try to explain to ordinary people what drives the liberal elite. The elite persists with some very strange and disturbing views. Are its members brainwashed, snobbish or just so remote from real life that they do not understand how things work? What is the pathology of liberal eliteness? 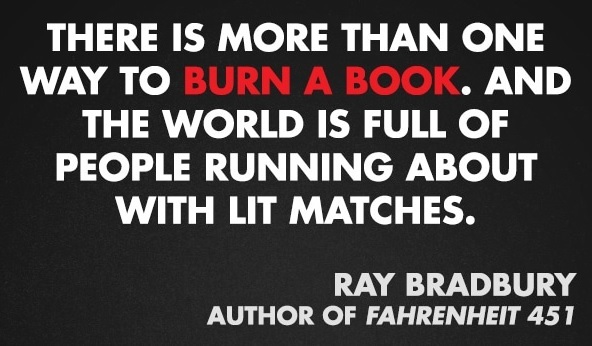 Google is a prime example of a perverted mindset that validates the new book burning.